Elan Daley recently began competing in the 2019 Central Region A Championships in Canada, placing first in a number of events in record breaking time. Daley finished with the fastest Girls 13-Year-Old 200 Long Course Meter Freestyle Preliminary time, touching the wall in a time of 2:07.16. In the Girls 13-Year-Old 200 Long Course Meter Freestyle A Final, Daley won the gold medal with a time of 2:07.71. 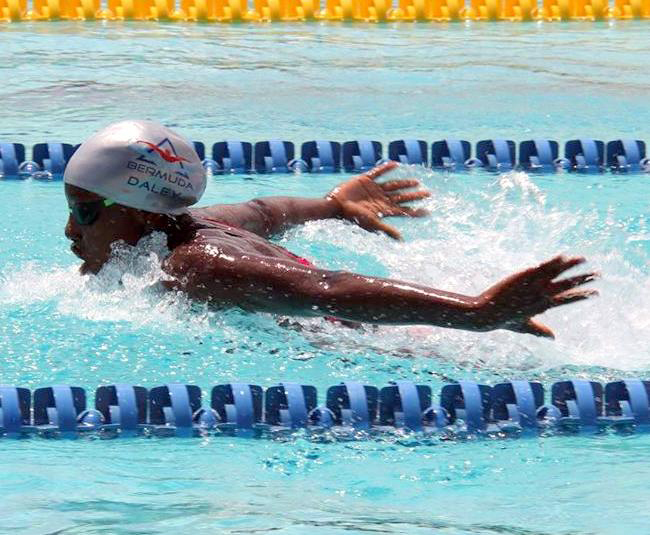 Daley’s time in the preliminaries broke her record of 2:10.26, set back at the XXXIII Carifta Swimming Championships in Kingston, Jamaica. Daley also recorded the fastest Girls 13-Year-Old 50 Long Course Meter Freestyle Preliminary time with a time of 26.85 and went on to win the Girls 13-Year-Old 50 LC Meter Freestyle A Final, touching the wall in a time of 26.41. Daley broke the record of 26.59 she set back on April 3, 2018 during the XXXIII Carifta Swimming Championships in Kingston, Jamaica. On day two, Daley captured another two gold medals and broke another Bermuda age group record. Daley captured the gold medal in the Girls 13-Year-Old 100 LC Meter Freestyle A Final with a time of 57.69, breaking her own record of 58.11 set during the preliminaries. Daley then won the Girls 13-Year-Old 100 LC Meter Butterfly gold medal when she touched the wall in a time of 1:04.78 during the A Final. Earlier, Daley finished with the fastest Girls 13-Year-Old 100 LC Meter Freestyle Preliminaries by clocking a time of 58.11 to advance to the A Final. The time broke the previous record held by Logan Watson Brown set back on May 18, 2016 during the Validus National Championships in Bermuda. Daley qualified for the Girls 13-Year-Old 100 LC Meter Butterfly A Final after clocking the fastest preliminary time of 1:05.67. She also led off the Etobicoke Swimming Girls 13-14 200 LC Meter Freestyle Relay team that clocked a winning time of 1:50.83.